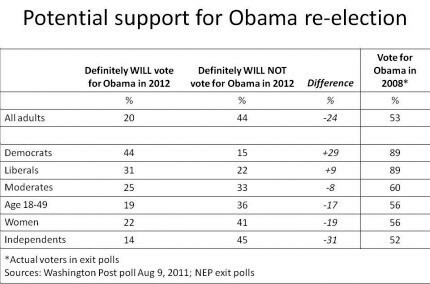 A Washington Post poll conducted August 9, 2011 has some bad news for Obama. Only 20% of Americans and only 33% of Liberals now say they will definitely vote for him. 78% said they were Dissatisfied with the way the country’s political system was working. 71% said they thought the federal government was focused on the wrong things. 73% were NOT confident the government in Washington could solve economic problems. 69% said they were inclined to look around rather than re-elect their Congressman.